Background: The toxicity due to lead is a widely researched sphere of public interest. Positive associations have been identified between lead exposure and coronary heart disease and cardiac rhythm disturbance. This study has been undertaken in general population to determine whether the blood lead level has any role in cardiovascular disease. Aims and Objectives: To estimate the blood levels in young patients with Myocardial Infarction and compare with the older patients. Settings and Design: A descriptive cross-sectional study was conducted among 100 patients with Myocardial Infarction [MI] admitted in a private medical college over a Study Period of 12 months categorized into 2 groups of 50 each based on age <45 yrs and >45 yrs. Materials and Methods: Patients with ECG changes suggestive of Myocardial Infarction and elevated CKMB and Troponin I were included and patients with other than the conventional risk factors were excluded. Patients were further investigated for complete blood count, fasting lipid profile, serum electrolytes, 2D echocardiograph, CK-MB, Troponin I and blood lead levels. Results: The prevalence of MI was 94% and 8% in men and women of the younger group whereas 74% in men and slightly higher percentage of 26% in women of the older group. The mean blood lead levels was 8.392 mg/dl with a standard deviation of 4.5 mg/dl among younger patients as compared to mean of 15.048 mg/dl with standard deviation of 2.5 mg/dl indicating a significant increase in blood lead levels as the age progresses, though the lead levels were in normal range. Conclusion: The study revealed a significant correlation of serum lead concentration with progression of age, though no such correlation was found with Myocardial Infarction. However further studies with healthy participants, larger sample size and data in regards to specific occupation, life style and geographic location can yield significant results to attribute serum lead as a risk factor for developing cardiovascular disease. Lead is a normal constituent of the earth's crust, with trace amounts found naturally in soil, plants, and water. Lead finds use in manufacture of diverse products, ammunition, cable covers, and radiation shields. Globally, among the array of toxic heavy metals, lead is most widely used in industry and at home resulting in a variety of hazards due to environmental contamination. Lead toxicity was recognized and recorded as early as 2000 BC. It exerts deleterious effects on the hematopoietic system, renal system, neurological system, reproductive system, skeletal system, and cardiovascular system. Positive associations have been identified between lead exposure and coronary heart disease (CHD), stroke, and cardiac rhythm disturbance. All these studies share a common lacuna of few in number and associations less well established. This study has been undertaken to establish a correlation of blood lead levels in younger myocardial infarction (MI) patients and compare with older MI patients and to determine whether blood lead level has any role in cardiovascular manifestations. The aim of this study was to estimate the blood lead levels in patients with MI and to compare between younger and older patients. A cross-sectional study was conducted among 100 patients with MI admitted to a teaching hospital over a period of 12 months categorized into 2 groups of 50 each based on the age <45 years and >45 years. Patients with elevated creatine kinase (CK)-MB >25 U/L and positive troponin I and electrocardiography changes showing ST elevation (new ST elevation at the Jpoint in two contiguous leads with the cut points ≥0.1 millivolt in all; leads other than V2, V3 where the following cut points apply ≥0.2 millivolt in men ≥45 years; and ≥0.25 millivolt in men ≤45 years or ≥0.15 millivolt in women) and ST-depression and T-wave changes (new horizontal downsloping ST depression ≥0.05 millivolt in two contiguous leads and or T-wave inversion ≥0.1 millivolt in two contiguous leads with R wave or R/S ratio ≥1) were included in the study. Patients with other conventional risk factors of MI such as renovascular disease, primary renal disease, pheochromocytoma, primary aldosteronism, Cushing's syndrome, coarctation of the aorta, hypothyroidism, primary hyperparathyroidism, pregnancy, and oral contraceptive intake were excluded from the study. Patients were further investigated for complete blood count, fasting lipid profile, serum electrolytes, two-dimensional echocardiograph, CK-MB, troponin I, and blood lead levels. The study was carried out after taking the Institutional Ethics Committee Clearance and informed consent from the patients. The entire analysis has been carried out using IBM SPSS 19.0 (Armonk, Ny, USA) version at 5% level of significance. The statistical techniques used were linear discriminant analysis and independent sample t-test, and Wilks' lambda value. The total percentage of correct classification was observed to be 85% and the Fisher's linear discriminant function was used. This was a cross-sectional study conducted among 100 patients with MI admitted in a teaching hospital over a period of 12 months categorized into two groups of 50 patients each based on the age <45 years and > 45 years. The mean age among the young patients with MI was 39.92 with a standard deviation of 3.8 years and among older patients was 60.68 with a standard deviation of 8.6 years. 94% of men and 8% of women were affected among the younger group whereas 74% of men and slightly more women of 26% were affected among the older group. The mean body mass index (BMI) among the young patients was 23.92 kg/m2 with a standard deviation of 2.37 kg/m2 and among older patients was 21.55 kg/m2 with a standard deviation of 2.04 kg/m2. Twenty-three as against of twenty-one patients had a habit of smoking in young and older group, respectively, and 25 as against of 22 patients had a habit of alcohol consumption among young and older group, respectively. The prevalence of diabetes was found to be 32% and 40% among the young and older group, respectively. The mean systolic blood pressure among the young patients with MI was 122.4 mmHg with a standard deviation of 13.16 mmHg and among older patients was 123.84 mmHg with a standard deviation of 15.37 mmHg. The mean diastolic blood pressure among the young patients with MI was 76.6 mmHg with a standard deviation of 8.5 mmHg and among older patients was 79.48 mmHg with a standard deviation of 10.66 mmHg. In young MI patients studied, the mean hemoglobin levels were 13.49 g/dl with a standard deviation of 1.38 g/dl, whereas in old MI patients, the mean hemoglobin was 13.27 g/dl with a standard deviation of 1.32 g/dl. The mean CK-MB levels were 66.18 U/L with a standard deviation of 63.51 U/L among young patients, whereas in old MI patients, the mean CK-MB was 77.18 U/L with a standard deviation of 67.46 U/L. The mean total cholesterol among the young patients with MI was 154 mg/dl with a standard deviation of 37.81 mg/dl and among the older patients was 165.58 mg/dl with a standard deviation of 40.06 mg/dl. The mean triglyceride among the young and older patients with MI was 151.66 g/dl and 161.62 g/dl, respectively. The mean high-density lipoprotein was 58.34 g/dl with a standard deviation of 26.71 g/dl among young, whereas in old MI patients, the mean age was 63.26 g/dl with a standard deviation of 44.44 g/dl. The mean low-density lipoprotein was 83.74 g/dl with a standard deviation of 3.43 g/dl among younger group whereas it was 90.2 g/dl with a standard deviation of 40.10 g/dl in older patients. The mean very low-density lipoprotein among the young patients with MI was 38.12 g/dl with a standard deviation of 14.19 g/dl and among the older patients was 47.62 g/dl with a standard deviation of 27.43 g/dl. The mean ejection fraction (EF) among the young patients with MI was 57.56% with a standard deviation of 4.3% and among the older patients was 56.2% with a standard deviation of 5.2%, and 38% of younger patients had regional wall motion abnormality compared to 46% of older patients. The mean blood lead levels were 8.392 mg/dl among younger patients as compared to mean of 15.048 mg/dl among the older age group as shown in [Table 1]. There is a significant increase in blood lead levels observed as the age progresses significantly as shown in [Figure 1], and P value of the χ2 was 0.000. Serum lead has its toxic effects and has been proven to be hazardous to health in various parts of the world. Several epidemiological surveys done in the past have linked lead to various adverse cardiovascular events starting with hypertension to atherosclerotic changes., In our study, we have shed the spotlight on the effects of lead on major cardiovascular disease (CVD), namely, MI in a section of Indian population categorized into two groups based on their age (younger age group <45 years and older age group >45 years). The prevalence of type 2 diabetes mellitus and hypertension and the two important noncorrectible factors leading to MI were analyzed in the study population and showed a prevalence of diabetes around 32% in the young and 40% in the old, respectively. Previous studies have attributed an incidence of 20%–25% of diabetes in MI patients.,, The Prospective Cardiovascular Munster study has reported a three-fold incidence of MI in diabetics. Although most of the patients in our study had normal BP, few had cyclic shoot of BP which was controlled with appropriate antihypertensive administration. The correctible etiologies such as the prevalence of smokers and alcohol abuse were taken into account showing a prevalence of 46% smokers and 50% alcohol abusers among young patients as compared to 42% and 44%, respectively. In a study conducted by Grines et al., smoking has been attributed as a high and direct risk factor for MI. Firm scientific evidence suggests a U and L shaped relationship between alcohol consumption and total and CHD mortality, respectively., Previous meta-analysis of eight studies for which data were available, the random effects pooled sensitivity for acute MI was 68%, the specificity was 97%, and the diagnostic odds ratio was 104, and hence, the need for a supportive evidence such as CK-MB and troponin I was required. Of the two groups studied, 62% had ST elevation and 38% had ST depression with mean CK-MB value of 66.18% and 100% troponin I positivity in the younger group and almost similar results among the older group showing 62% had ST elevation and 32% had ST depression with mean CK-MB value of 77.18% and 100% troponin I positivity. Echocardiographic findings were almost similar among both the groups showing mean EF of 57.56 with regional wall motion abnormality in 38% of younger patients and EF of 56.2 with regional wall motion abnormality in 46% of older patients. 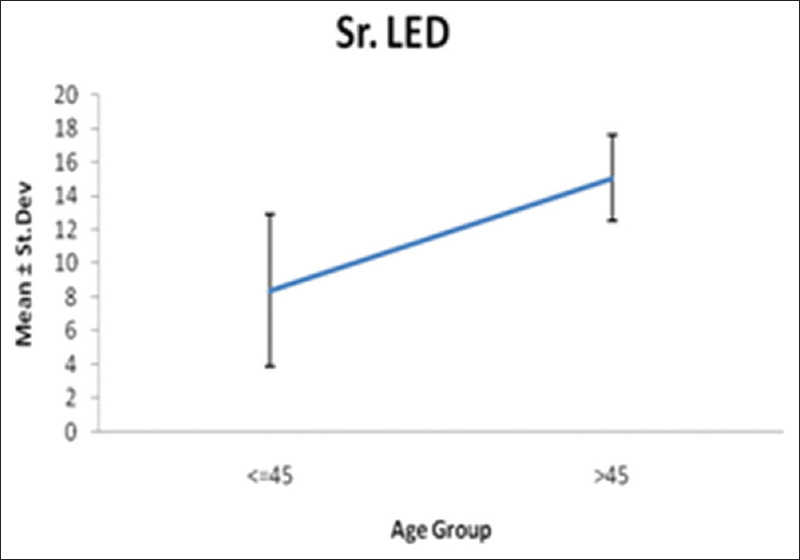 The mean serum lead concentration among the younger patients with MI (8.39 ± 4.5 μg/dl) was lower than the values observed among the older patients (15.05 ± 2.55 μg/dl), thus showing a statistically significant association (P = 0.000) demonstrating increase in serum lead levels as the age progresses. However, a direct correlation between the lead levels and MI could not be made as the lead levels were within normal range and the normal level of serum lead ranges between 10 and 60 μg/dl. Some younger patients blood lead levels were less than the normal range. We attribute this to vast discrepancy regarding lifestyle, occupation, and geographical regions of the study population observed. This study was aimed to estimate blood lead levels in younger MI patients and comparison with older patients and to determine whether lead levels have any role in cardiovascular manifestations, particularly myocardial infarction. The serum lead level increased with progression of age; however, a direct correlation between lead levels and MI could not be determined as the lead levels were within normal range. We attribute this to sample size, lack of healthy participants, and a vast discrepancy regarding lifestyle, occupation, and diversified geographical variation of the study population. Further studies with larger sample size and data in regard to specific occupation, lifestyle, and geographical location can yield significant results to attribute lead as a risk factor developing CVD. D'Souza HS, Menezes G, Venkatesh T. Role of essential trace minerals on the absorption of heavy metals with special reference to lead. Indian J Clin Biochem 2003;18:154-60. Vaziri ND, Gonick HC. Cardiovascular effects of lead exposure. Indian J Med Res 2008;128:426-35. Navas-Acien A, Guallar E, Silbergeld EK, Rothenberg SJ. Lead exposure and cardiovascular disease – A systematic review. Environ Health Perspect 2007;115:472-82. Tavris D, Shoaibi A, Chen AY, Uchida T, Roe MT, Chen J, et al. Gender differences in the treatment of non-ST-segment elevation myocardial infarction. Clin Cardiol 2010;33:99-103. Reina A, Colmenero M, Aguayo de Hoyos E, Arós F, Martí H, Claramonte R, et al. Gender differences in management and outcome of patients with acute myocardial infarction. Int J Cardiol 2007;116:389-95. Grundy SM, Pasternak R, Greenland P, Smith S Jr., Fuster V. Assessment of cardiovascular risk by use of multiple-risk-factor assessment equations: A statement for healthcare professionals from the American Heart Association and the American College of Cardiology. Circulation 1999;100:1481-92. Eckel RH. Obesity and heart disease: A statement for healthcare professionals from the Nutrition Committee, American Heart Association. Circulation 1997;96:3248-50. Shiraki T, Saito D. Clinical features of acute myocardial infarction in elderly patients. Acta Med Okayama 2011;65:379-85. Schoenenberger AW, Radovanovic D, Stauffer JC, Windecker S, Urban P, Niedermaier G, et al. Acute coronary syndromes in young patients: Presentation, treatment and outcome. Int J Cardiol 2011;148:300-4. Health and Welfare Statistics Association. Dyslipidemia. In: Journal of Health and Welfare Statistics. Tokyo: Health and Welfare Statistics Association; 2010. p. 80-1. Aleksic E, Stamenkovic R, Deljanin-llic M, Tasic I, Savic T, Vacic A. Attainment of target blood pressure values in patients with survived myocardial infarction and diabetes mellitus. Sci J Fac Med In Nis 2010;27:125-34. Norhammar A, Malmberg K, Rydén L, Tornvall P, Stenestrand U, Wallentin L, et al. Under utilisation of evidence-based treatment partially explains for the unfavourable prognosis in diabetic patients with acute myocardial infarction. Eur Heart J 2003;24:838-44. Franklin K, Goldberg RJ, Spencer F, Klein W, Budaj A, Brieger D, et al. Implications of diabetes in patients with acute coronary syndromes. The global registry of acute coronary events. Arch Intern Med 2004;164:1457-63. Assmann G, Schulte H. The prospective cardiovascular münster (PROCAM) study: Prevalence of hyperlipidemia in persons with hypertension and/or diabetes mellitus and the relationship to coronary heart disease. Am Heart J 1988;116:1713-24. Grines CL, Topol EJ, O'Neill WW, George BS, Kereiakes D, Phillips HR, et al. Effect of cigarette smoking on outcome after thrombolytic therapy for myocardial infarction. Circulation 1995;91:298-303. Thun MJ, Peto R, Lopez AD, Monaco JH, Henley SJ, Heath CW Jr, et al. Alcohol consumption and mortality among middle-aged and elderly U.S. Adults. N Engl J Med 1997;337:1705-14. Gaziano JM, Gaziano TA, Glynn RJ, Sesso HD, Ajani UA, Stampfer MJ, et al. Light-to-moderate alcohol consumption and mortality in the physicians' health study enrollment cohort. J Am Coll Cardiol 2000;35:96-105. Ioannidis JP, Salem D, Chew PW, Lau J. Accuracy and clinical effect of out-of-hospital electrocardiography in the diagnosis of acute cardiac ischemia: A meta-analysis. Ann Emerg Med 2001;37:461-70. Shiri R, Ansari M, Ranta M, Falah-Hassani K. Lead poisoning and recurrent abdominal pain. Ind Health 2007;45:494-6.